Surströmming ("soured (Baltic) herring") is a northern Swedish dish consisting of fermented Baltic herring. Surströmming is sold in cans, which often bulge during shipping and storage, due to the continued fermentation. When opened, the contents release a strong and sometimes overwhelming odour. 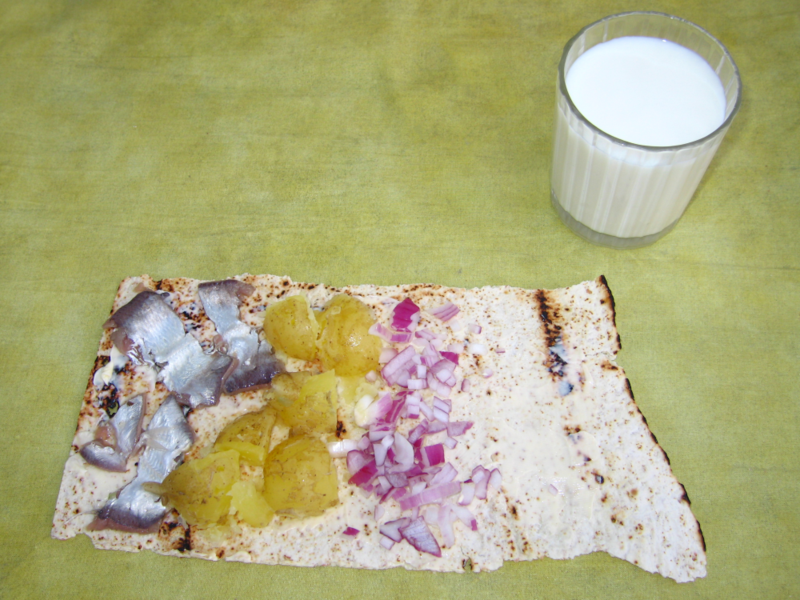 Left: Surströmming with potatoes, onion on tunnbröd. The herring is caught in spring, when it is in prime condition and just about to spawn. The herring are fermented in barrels for one to two months, then tinned where the fermentation continues. Half a year to a year later, gases have built up sufficiently for the once cylindrical tins to bulge into a more rounded shape. These unusual containers of surströmming can be found in supermarkets all over Sweden. However, certain airlines have banned the tins on their flights, considering the pressurized containers to be potentially dangerous. Species of Haloanaerobium bacteria are responsible for the in-can ripening. These bacteria produce carbon dioxide and a number of compounds that account for the unique odour and the sour (acidic) properties: pungent (propionic acid), rotten-egg (hydrogen sulfide), rancid-butter (butyric acid), and vinegary (acetic acid). Historically, other fatty fish like salmon and whitefish have been fermented not unlike surströmming, and the original gravlax has resembled surströmming. Surströmming is often eaten with a kind of bread known as tunnbröd, literally "thin bread". The custom is to make a sandwich, commonly known as a "surströmmingsklämma", using two pieces of the hard and crispy kind of tunnbröd with butter, boiled and sliced or mashed potatoes and sliced fish in between and nothing more. Left: Opened can of surströmming in brine. In the south part of Sweden it is customed to use a variety of condiments such as diced onion, gräddfil (fat fermented milk/sour cream) or crème fraîche, chives and sometimes even tomato and chopped dill. The surströmming sandwich is usually served with snaps and light colored beers like pilsener or lager. 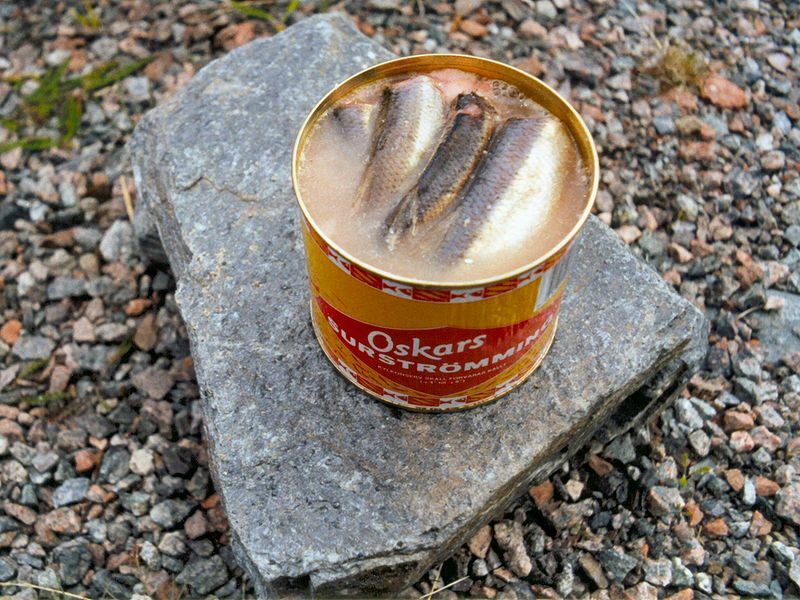 Some claims that cold milk is the right and only choice to go along with the surströmming. Many people do not care for surströmming, and it is generally considered to be an acquired taste. Conversely, it is a food which is subject to strong passions (as is lutefisk), and occasionally people like the taste on first try. In fact, there are usually no middle levels - you either love it or hate it.